This time I decided that my doll Sophia needed some new nightclothes. These clothes I have knitted in cotton. I think they were very nice dressed on Sophia. 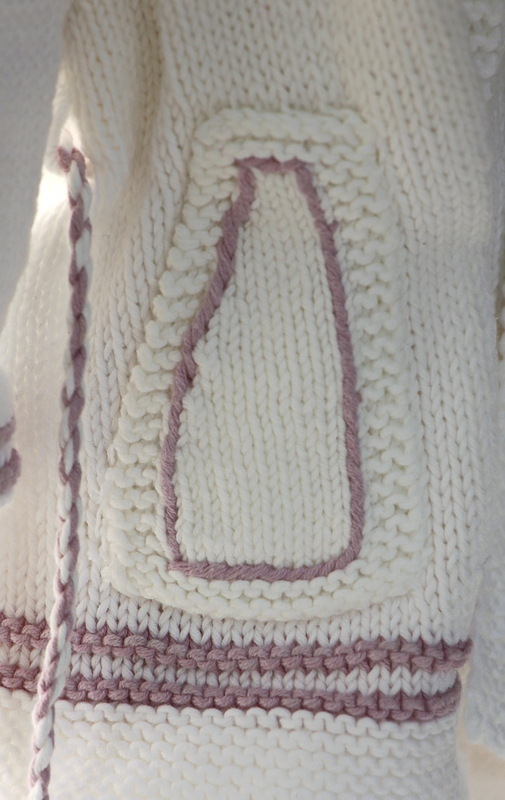 Both the nightgown and the slipper are knitted in white cotton yarn and they have a few lilac stripes knitted in. First, I knitted the nightgown. This nightgown reach the leg and it has a little mantle. Marked with some lilac stripes before knitting the rest of the dress. Round the neck, I have knitted garter sts. The dress has short sleeves that is kept together with stripes like the mantle round the night-gown. A cute little heart button in lilac is sewed to the front top. 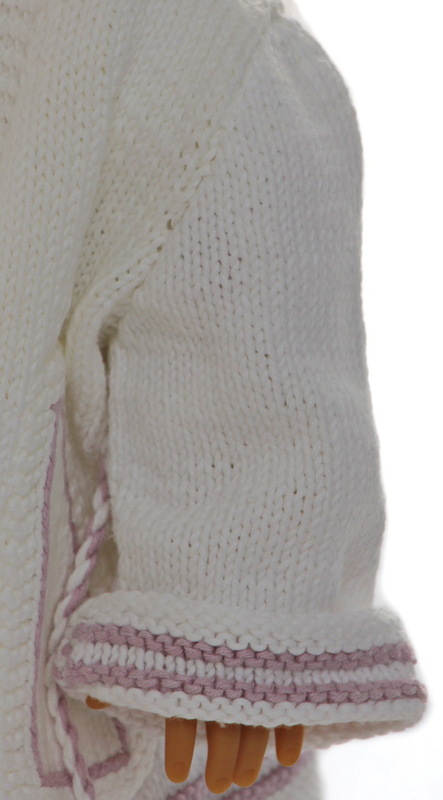 It has white edges front knitted in garter sts. Then a pair of lovely slippers were needed. hey are small and knitted in garter sts. They have a lilac stripe the nightclothes have. On the pockets, I have broidered back sts inside the edge sts. Along each side, I have sewed small loops of buttonhole sts for the chord round the waist. 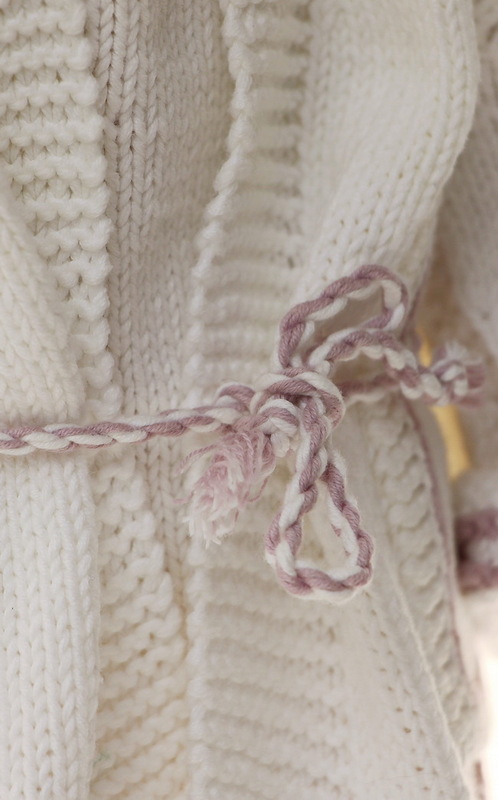 The yoke is knitted in st st and buttoned with small lilac buttons. A cute baby-doll for Sophia. They I decided to knit a baby-doll for change. This I knitted in yellow. Cast on 140 sts and knit 1 row. 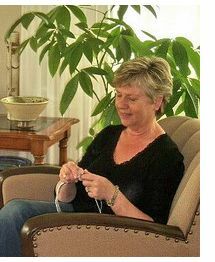 Continue knitting on a circular ndl or 4 double pointed ndls and knit in the round dbl moss sts until work measures 9 cm. Knit 1 row. Next row: Knit a row of eyelets like this: k2tog, yon alternatively across row. Next row. Begin at 1 side: P8, k54, p16, k54, p8. Knit 1 row and repeat this row. ... are tied at each side with lilac chords.